Product prices and availability are accurate as of 2019-04-19 17:06:19 EDT and are subject to change. Any price and availability information displayed on http://www.amazon.com/ at the time of purchase will apply to the purchase of this product. 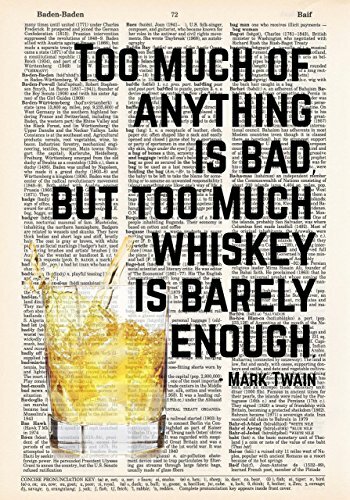 Whiskey lovers will love this image of a glass of whiskey being poured next to a quote by American author Mark Twain. 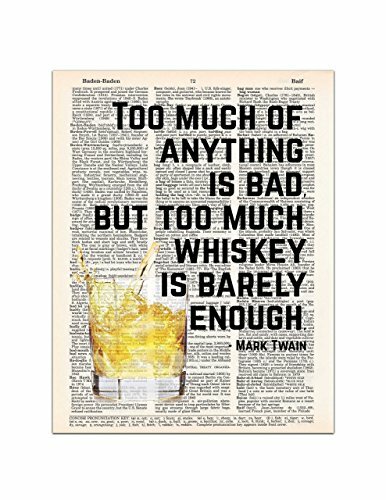 "Too much of anything is bad, but too much whiskey is barely enough." 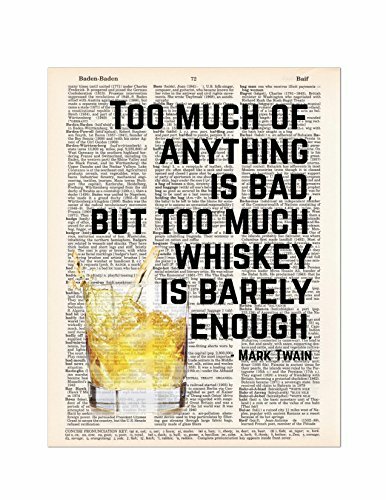 Great for a man cave or a bar. It also makes a great gift for dad. It is printed on a real dictionary page, ready for you to frame. * SIZE = 8" x 11" (approximately). We recommend using an 11"x14" or larger frame with a mat that has an 8"x10" opening. You can also buy an 8X10 frame and trim the print slightly to fit. * REAL DICTIONARY PAGES: Pages come from real dictionaries that are between 30 and 100 years old and are in danger of ending up in a landfill . * UNIQUE: Each print is on a different dictionary page. The images shown here are just samples. Unfortunately, we cannot choose pages with certain words on them that "match" the print. We would have to waste a lot of pages if we did that, and that would defeat the purpose of recycling the dictionaries. * SHIPPING: The prints are placed inside a plastic sleeve with a piece of cardboard for protection. The cardboard and plastic are not part of the product. Please discard or recycle the plastic and the cardboard piece before you attempt to frame it. * MADE IN THE USA: We are an American-owned small business. We appreciate your support! * READY TO FRAME: Frames and mats are not included. You only get the dictionary page.